I'm a slightly traumatized solar newbie. I had a 2kW grid-tie system installed on my house, with 8 commercial poly-crystaline 250W panels, and a KACO 2.8kW inverter. The system had been operational for about a week, then we had a heavy rainstorm come in last weekend. Around noon, it cleared up for a while, and there was an hour or so of good sun. Sometime around 1pm, one of the panels caught fire, and the fire spread to three of the neighboring panels. Fortunately, my house is close to the fire station, and the neighbors were observant (I was out of town), and the blaze was put out quickly. The damage to the house was limited, and the installer is taking care of the situation. However, I have a lot of questions, and thought maybe someone here could share some of their knowledge with me. First, I understand this is an extremely rare occurance. But I'm trying to build up some confidence for replacing the system, and it would help if I could understand what went wrong. The water theory jibes with the rain, but in my (limited) experience, a water-based short usually remedies itself when it gets hot enough to evaporate the water. I could conceive of a situation where the steam would deform something sufficiently to cause a wire short. The voltage leak theory seems weak to me, because the system had been successfully operating for a week. I'd imagine the inverter is really good at isolating the line from the panels, seeing as that's a significant part of its design goal. To support the defective panel theory, I've noticed something with the four panels that didn't burn up: there seems to be numerous separations of the leads from the individual cells (see pictures for a few examples). Now, I didn't observe the panels before installation, and I don't know that this isn't a result of rough handling during the removal of the panels, but it does looks somewhat suspicious to me. Does any of this make sense? Are there installation errors that might explain the fire? I'd really appreciate any insight anyone can share. sorry for this loss. as to what officially started the fire, i can't say for sure. i suppose we could speculate, but we can't even do much of that without more info to go by. who exactly has said what to you? i can say those pvs are bad and i'd like to know the make and model of them. I have never heard of this happening before. And I don't see any real clues to show if it was part of a pre-existing problem, or actually weather caused. To be honest, I did not think a panel would even sustain a fire for long - were the panels burning or the underlyhing roof? Interesting photos though, and I also would like to know what panels they are. And is it possible you would have a warranty claim? Never heard of such a thing! Thanks for the quick responses! As for the fire, it was definitely the panels burning, not the roof (at least initially). I can send pictures and manufacturer information privately -- I don't want to post them publicly yet in the event that my facts are not correct. At this point, I'm still trying to get all the information straight, and I don't want to impugn anyone without solid evidence. My contractor has told me that he has spoken with the manufacturer and they will be reimbursing him for the panels. He has also said that he intends to use a different make for the replacements. I'll try to get documentation so I can post more facts. Are there any specific questions I should be asking at this point? Rain water itself is non-conductive (unless you are on the coast and get a lot of salt fog... Which should not be an issue this time of year, or on an install that is only a few weeks old). Are those photos of panels that "burned"? I don't see any blackening, so I would guess those are the panels that "burned" but the photos are of areas near the burned areas? At this point, I would check the mfg. and NRTL tracking information (everything that is UL approved shall have traceability back to the factory/lot inspection information) and ensure that you got the panels you ordered. You (or your vendor/insurance company) need to send out the panels for failure analysis. My two cents worth--If the failure is water related--water got into the panels and caused the panel/cell/copper-solder connections to corrode and/or delaminate--causing the copper cell connections to either increased resistance or arcing, which started the fire (you see signs of the lifted copper/solder connections). In either case, whether water infiltrated the panel, or just the bonding connections failed--this would not be a good sign. If you can inspect the rest of your panels close up, or with a good pair of binoculars--see if you find any areas that "look different" (browned--hot spot, different reflection--possible delamination, etc.). But, be aware that not all discolorations mean there is a problem... For example, at the low edge of my panels, I will get brown stains that look bad--but come of the glass with a bit of soap, water, and scrubbing. At this point, failure analysis by the panel company or an independent 3rd party would be something I would push for. This is not "normal" operation and can be extreme safety issue for your home. They should be able to tell you exactly what went wrong and how the panels currently on your roof will not fail in a similar manner. The photos are of panels that were a good ten feet or more away from the panels that burned. We only had eight panels, so we took down the four "good ones" after the fire. The previous pictures are from those panels. I'm attaching a picture of some of the burnt panels, before and after. It's hard (for me, anyway) to get much information about the panels from it. The telephoto perspective in the "before" picture makes a neighbor's chimney look very close, but that's a red herring. Interestingly, the surviving panels do not have any manufacturer's markings on them, nor any UL stickers. So I'll need to talk to the rep who provided them. How does one go about finding a facility for failure analysis? Those pictures with the "lifted" copper bus tape are of the "good" panels? Also, the "average" panels I have seen (and I am certainly no expert) are usually vacuum bonded between the backing, cells, and the cover glass. There is no room between the cells and the glass for the copper tape to "lift" -- or really even shift. On the good panels, is there an air gap between the top glass and the cells underneath? Again, from a keyboard hundreds (or thousands) of miles away--no sticker or NRTL (UL, ETL, etc.) markings--I would guess these are gray market imports and would not be legal (or apparently safe) for use with GT Inverters (or really any installation). If it where my home, I would pull the AC Breaker and/or DC disconnect for the array/inverter and not power it up again with those panels. And--I would be tempted to file a police report. Somebody is not doing the install correctly. From looking at the the way the panels are mounted--no rails/structure underneath the panel+frames and what appear to be home made mounts directly to the panel frames... This system would not meet any code that I am aware of. 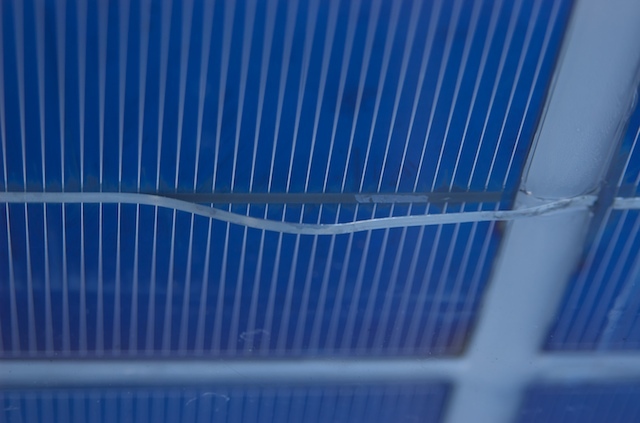 Insufficient structural support of the solar arrays would possibly cause copper tape bonding failure from excessive flexing (and poor panel construction)--which could have been exacerbated by the local weather and wind loading. Hate to ask, but was this an engineered and permitted install done in California (LA or San Diego area?)? If so, notify the local fire marshal, building inspector, CA contractor's license board, police, your electric utility company, and the contractor's insurance company. This installation was close to arson. If this was not a licensed contractor / permitted install and you knew it... You are lucky nobody was killed. And yank the system and keep everything for evidence. Again--my two cents worth. I am certainly not an expert in the field, and I am only going by the few pictures posted here and I could be way wrong in my estimation of the install and the issues as I perceive them. If I am, please let me know and I will delete this post. PS: One other question from me... Are the panels covered with plastic/Lexan/etc. instead of glass? From the burn pattern when magnified (from the reduced resolution pictures), the panels seem to have melted/burned the cover "glass". And the remains where the panels have been seem to only include a bit of rails and silicon cells--no obvious glass left behind (if tempered glass, should be those little cubes of glass when tempered glass shatters--otherwise some large slivers should still be visible). If the panels are plastic covered--they probably will not last more than a few years before the plastic begins to seriously degrade from the sun's UV. Although the mounting system is pretty primitive, I can't see it being related to the fire. Seems like the most likely cause would be that the panels were not weatherproof, and you got just enough corrosion to cause numerous hot spots. But even in cases I have heard of or seen of things like panels wired backwards to a battery, parts of the panel might melt, but not burn. 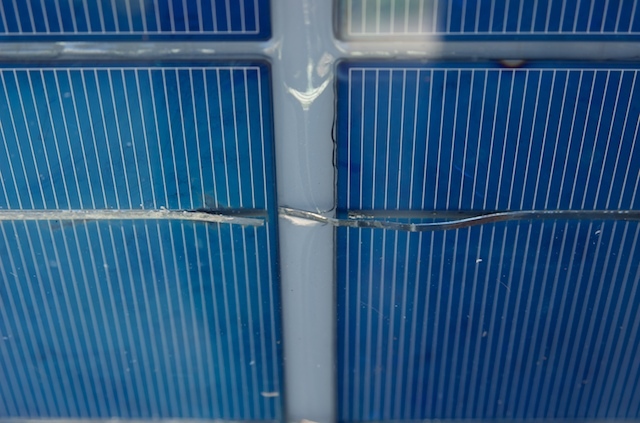 I see the "corner" mounting of sets of panels allowing them to flex from wind loading (and even from thermal cycling too)--causing the copper tape to lift from the solar cells--causing high resistance/arcing at several hundred volts and 4-8 amps. Enough heat to set fire to the panel materials. I did a PS to my previous post (you may not have seen it)--where I said it looks like the panels are made with plastic rather than glass. If the panel covers are plastic and not glass--then they would be able to flex much more than a regular "glass panel/array"--further allowing the copper to stretch/flex/work harden/lift from the solder bonds of the silicon cells (which will barely bend without breaking). Have you seen this type of solar PV panel construction before? UL panels are made with tempered glass, its doesn't melt like the pictures shown. In UL panels, the backing and sealant doesn't burn either , I've done some rework on panels ( fixing bad connections ) and have seen burn spots where high resistance was so hot its browned the cells. looks like home made panels, the frames are undersized and visibly dropping with the mounts shown and as other pointed out, the mounting is clearly not to code. I also second everything BB said, this isn't just some manufactures defect, someone is selling none UL panels and I assume this is a CA rebated system which I should think falls under out right fraud or worse criminal act as the installer is stealing funds from the state. There is NO way the installer didn't know what they did was wrong, and on so many levels, this needs the attention of the police, fire chief, building department and the "installer" should not be allowed on the premises until the above authority's have determine what happened. As BB said, you are very lucky this didn't burn down the home or worse killed someone in the fire. This is why we have NEC/UL and have systems installed with the approval of the building department ... as WindSun says, I too have never seen this and I can say for sure, the panels are NOT UL approved. Based on the photos, I'm wondering if these modules have an epoxy front surface, rather than a glass surface. First, the lack of tempered glass debris, plus the photos which appear to show the solder traces lifting off the cells. There's a lot of bad things that can be done to a module, but solder magically popping through the glass is not one of them. 5. Were the modules arranged in a single string? Or two separate strings? If the array was two or more separate strings, were series fuses installed? Did the system work as expected for the week after install? Can you check the ground fault protection fuse in the inverter, and confirm whether it is still intact? Double check to make sure the installer didn't bond negative to ground outside the inverter -- the white conductor from the array should not be connected to the green or bare wire anywhere. Take heart -- this is NOT normal in the solar world. You can have a system which will provide safe renewable energy for years to come. However, I would strongly suggest you find the best, most respected solar installer in your area and have them inspect your system from top to bottom. Pay them for their knowledge and experience. While SolarPhil has some very good questions... Other than making sure the power to the inverter/from the array is OFF, I would not touch a thing until you get the insurance (yours and the installer's) and possibly arson investigators out there (or equivalent from police/building/sheriff, etc.). This is probably a crime scene. And you were most likely defrauded by the installer/supplier. Sorry to sound so melodramatic--but you and your family were extremely lucky that the rest of your home was built to code (fire retardant roofing material). 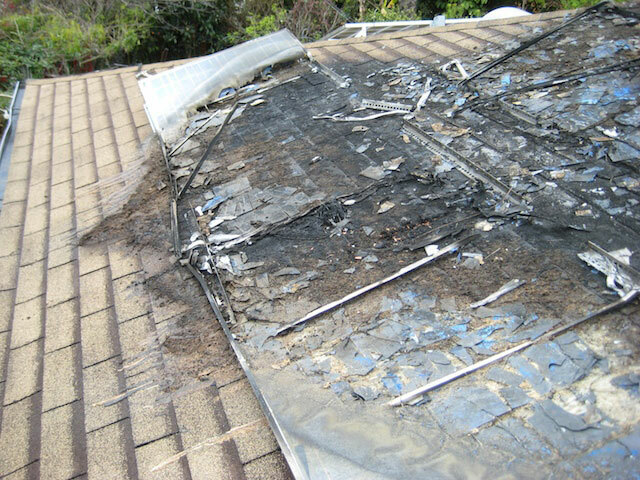 And, I would guess, you need to get a new roof on that section of your home before there is a major storm to prevent water damage in your home (which would probably be worse than the fire damage you have so far--between sheet rock, insulation, carpet, subfloor, and personal property damage... Plus mold/mildew from water infiltration). Like I said last night,,,, and after seeing all the pictures,,,,WOW! You've all given me a lot to think about. I agree, we were very lucky. We are lucky that we live close to the fire station, that we have observant neighbors, and that they were able to respond so quickly. The panels have a plastic substrate, and what appears to be lucite or similar material facing. They have no glass. I will still hold off posting the name of the manufacturer until I know that that's really where they came from. The installer is licensed. The installation was permitted, inspected, and approved by the Los Angeles city inspector. All the panels are down, and the disconnects have all been pulled (we have disconnects on both the AC and DC sides of the inverter). ...The installation was permitted, inspected, and approved by the Los Angeles city inspector. That makes me wonder just how they got by the inspector. Did they actually come by and look at the installation, or just sign off on it by looking at the drawings and bill of materials? I need to make sure that the panels actually come from the source before I post names. I don't want to make false accusations. I have the paperwork at home, and will dig that up tonight and post it. I'll also be able to post more details about the panels. The system was working for the week. I obsessively was checking power generation Generation was actually only about half of what I'd expected from PVWATTS, but I didn't know if I had measured the angles correctly. I'm a software guy, so all the hardware details can be a bit overwhelming. I'm at the limit of my technical understanding here, but I'll try to answer all the questions as best I can. I can also post pictures of the various components. I believe the panels were in two strings, but I'm not certain. There are disconnects on both the AC and DC sides of the inverter, and there are fuses in the disconnects. I believe that this was an anomalous situation. I'm still committed to having solar. I appreciate all the help and advice. No, the inspector came out, looked at the plans, climbed up on the roof and checked things out. I was there, and he spent at least 45 minutes looking around. Well--You have proved that building inspectors, many times, are only as diligent as the property owner themselves. If you don't ask, point, and such... They will just do a quick look and leave it at that. And, if you do not education them on what they missed (lack of NRTL names/stickers on the panels; lack of "wet stamped" civil engineer calculations of mounting/loading; and/or installation did not match documents on file with the permit/inspection department), they will make the same mistake over and over again until a major fire takes lives and/or multiple homes in the neighborhood (imagine if this occurred during the fabled Santa Anna winds--which would have been likely if the panels lasted 6 months). You would have spent the next decade trying to defend yourself with little evidence left behind (and your insurance company would have just paid off--and perhaps--tried to sue the installer). Again, at this point in time, you need to get the "professionals" involved. Don't do anything that may shift the "blame" on to you. And do it quickly, it is possible that they would Red Tag your home until the basic repairs are done (roof, removal/capping of roof-top hardware). I appreciate that you don't want to tar somebody and their business with, what could turn out to be, false accusations. HOWEVER, this guy dam near burned your home down and killed you, your family, and/or neighbors due to his negligence and/or greed. He is no friend of yours (and, as you can see, not many others will look out for you either). Rule #1--Watch out for your family and yourself first. rain water got into the cableing, followed the conduit to the inverter and pooled in there. Sun came out, and water had inverter all messed up, and back fed the panels. I doubt PV's have enough surface area to self-ignite from their own voltage, run some light into them, and they radiate it as heat from all their surface area. BUT if you feed mains voltage into them, with Hover Dam supplying the amps, they would flame, esp. if they were plastic. This is a major rip-off, maybe it was an install sponsered by the "Electric Company" to show PV in a bad light. As far as I know the Power-One / Magnetek sting inverters are the only transformerless string inverters offered in the US. The Kaco cut sheets all indicate that their products are "electrically isolated", which would suggest that they are transformer based. My understanding is that the Kaco products, at least the "xi" line, use a high frequency transformer based topology. The owner's manual seems to confirm this, referring to a "RF Transformer" circuit design. I respectfully disagree with any blanket statements about inspectors. The problem is inspectors who are out of their element. An ICBO/BOCA building inspector does not have the expertise to do detailed electrical inspections. A certified electrical inspector is not competent to inspect reenforcing steel. Not withstanding incompetent, lazy, or arrogant, or dishonest inspectors (yes I know they exist!) the bulk of inspectors are hard working, under paid professionals. The problem is that in many jurisdictions, inspectors are required to inspect items out of their area of expertise. In smaller jurisdictions, electrical has been left to either the state or province, or has been delegated to the utility company. Personally, I have always been in favor of the utility being involved since they have to deal with what you wired. Building/electrical inspectors have always been looked at as the enemy. In my experience on both sides, I found that everyone won when it was a partnership. I propose we use the remainder of this thread to finding the source of the OP's problem, and not to bash inspectors,,, there is a time and place for that, but now let's let the smart minds work! In the interest of full discloser, I used to be an ICBO building inspector in a small jurisdiction. The only electrical we did were temporary power poles, and trim finals, which included plug checks/gfi checks etc. We had electrical inspectors for everything else. PPS I would lean toward something backfeeding into the panels in this fire case. When we received our final electrical inspection on our home, the state inspector walked in, turned a wall switch on, exclaimed the lights work, and signed the inspection. He didn't check anything else! If he had, I don't think he could have found fault with anything though. Just to remind everyone (at least in California)--Building inspectors (and their city/employers) have no legal responsibility for the results of their inspections or recommendations/requirements--even if they were bribed. A knowledgeable consumer is usually best served by knowing what is right and wrong, asking questions, and directing the inspector towards areas of questions/disagreement with the contractor. The inspector can then be used to get the contractor to "address/fix" any outstanding issues. I too have seen good inspectors--my in-laws were having new windows installed in stucco... The inspector found a bad job of flashing and jumped all over the contractor. So--there are many good ones out there too. It used to be in the State of Washington, that Electrical Inspectors WERE liable for errors and omissions. I don't know if that is still true. Regarding whether the GT Inverter back-fed the solar array or not... My initial guess is no (assuming the inverter is NRTL rated). Limited back-feed of power to the array is a requirement of the NRTL regulations (and would require a fuse/breaker if back-feed current is non-zero in a proper installation). I would not want to even suggest the GT Inverter / vendor has having any fault in this particular issue without further information/failure analysis (which we, obviously, cannot do on a forum). The lifting of the copper bonding wires between cells (on the "good" panels) plus the fact that this array may have been producing at only 50% of expected capacity is leading me to believe that these panels are not constructed from flame retardant materials (and even flame retardant plastics burn quite nicely in the right conditions). As well as that they are plastic panels, poorly framed and mounted, and (99.999% chance) not NRTL approved. In any case, further speculation here is probably not to useful. It is in "sundiego's" hands now. as i originally said, about all we can do is speculate and we have very little information on the system to speculate with. i do agree that something smells fishy and i believe the insurance company may want to get into this in depth to determine the true cause or causes. inspectors may try to cover their own butts too due to allowing something defective to slide by them. if your insurance company can lay blame on bad equipment, installation, or inspections then they may wish to pursue something further against them. you should still be reimbursed once you are cleared in their minds, but i see your insurance company as the only one that may want and get to the truth. doing this on your own may prove costly and futile even with an attorney and is why the insurance company may be your best bet. this may also allow you to possibly lay in a lawsuit of your own, but i'm no attorney. in any case, we (speaking for all here) do want to be kept up to date on this, but if it causes any possible problems for you legally then make us wait. if this is the result of unscrupulous people or bad equipment, we want this brought out and that those responsible are made to answer for their deeds firstly. in this justice pursuit we would have confirmation without any ramifications against us of hazards that exist that we can advise on. this may be the result of one of those that take advantage of the go green people with their scams and when it comes to property loss like this that endangers lives too, nobody should want anything else except the truth and justice to be enacted. BOTTOM LINE HERE IS THIS SHOULD NEVER HAVE HAPPENED! Sometimes this simply means that the inspector is familiar with the standard work of your electrical contractor. While this tends to strike those of us with a DIY bent (who get inspected in detail, precisely because they have never seen our work before) it's not unreasonable when there is a long history of proper installations done by the same people. On the other hand, if there has been a history of problems with a contractor, you may find a whole different approach to the inspection because of that. I apologize for not providing more information yet. I will post more information just as soon as I have it available and have confirmed that it is correct.